When I first read about the new Suplex 5 link rear suspension I thought it sounded great and would be wonderful for Project Phoenix. Two things held me back from purchasing a kit - Firstly I felt it was not really traditional Morgan and secondly, I had not budgeted for the significant investment involved. Fast forward to 2019 and that all changed with the factory now building all new Roadsters with a 5 link suspension. Yes, my budget would still take a hit but I decided to bite the bullet and fit a complete set of upgraded front and 5 link rear suspension from SSL, the British company which now supplies Morgan with components and carries what was formerly the Suplex brand. This was a big investment but with the chassis unencumbered by a body it was the ideal time to fit these components. SSL shipped the parts (44kg) to me and have been most helpful throughout. The quality of the components is reflected in their pricing - beautifully made. On advice from SSL I also fitted their front suspension upgrade to ensure compatibility between front and rear suspension spring rates etc. 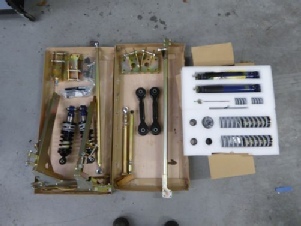 The front spring package was quite easy to fit for anyone who has dismantled/installed Morgan front suspension. The 5L rear suspension was fitted next. This is not a five minute job and does require a good level of mechanical knowledge and skill. However, the instructions with the kit are very detailed and if followed to the letter make the whole installation quite straightforward. I would strongly advise having the car on a hoist for this project though. There are variations to Morgan chassis over the years and I did have to make a few adjustments to the instructions to allow the kit to fit the early Plus 8 chassis I am using for Project Phoenix. Working at my relaxed pace the installation took about three days, allowing for a couple of modifications along the way. The end result is a very professional setup and it is easy to see why this system is a vast improvement over the traditional Morgan leaf springs. Remember what a revolution the first Range Rover was compared to the Land Rover in terms of ride quality? Most of that came down to using coil springs rather than leaf springs. The photo below shows the 5L system installed.